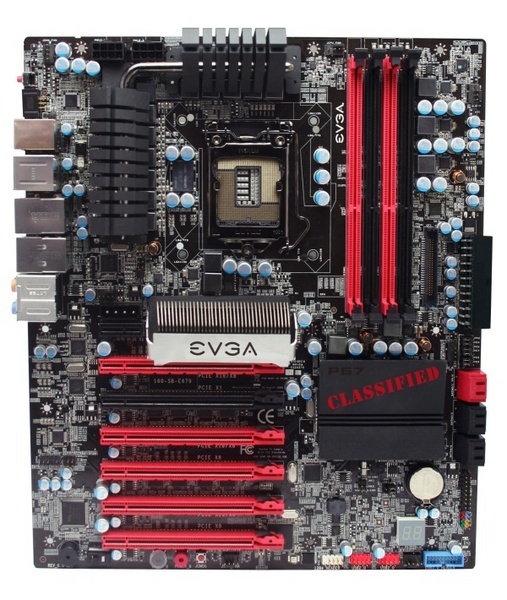 EVGA unveiled its next enthusiast-grade motherboard: the P67 Classified. The board is designed for upcoming “Sandy Bridge” processors from Intel in the LGA1155 package, using an Intel P67 Express chipset. EVGA’s main design goes seem to be: 1. giving the processor a strong VRM that helps with overclocking; and 2. to expand the board’s PCI-Express resources using an nForce 200 bridge chip. The CPU is powered by a 12-phase VRM that draws power from two 8-pin EPS connectors. Knowing EVGA, the CPU socket is of premium-grade, with higher gold content on the pins. There are four DDR3 DIMM slots are powered by a 3-phase VRM. The main ATX power connector is angled for better aesthetics. Expansion slots include six PCI-Express 2.0 x16 (electrical x16/x8;x1;x16/x8;x8;x16/x8;x8), making the board capable for 4-way SLI. A single PCI-E x1 is tucked away on top. Connectivity includes two internal SATA 6 Gb/s, four internal SATA 3 Gb/s, two front-panel and two rear-panel USB 3.0, 8-channel HD audio, two gigabit Ethernet controllers, FireWire, and eSATA. The board supports a plethora of overclocker-friendly technologies, including EVGA’s EV-Bot module. One can expect more information once Intel’s upcoming processors are out.